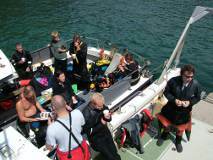 Here are a few of the more recognised local dive sites. We have not described each in detail as they are generally well documented. Search for reports on sites such as Divernet www.divernet.com to get divers’ appraisals rather than a dive operators ‘image’. Please contact Andy if you’re having difficulty finding information. At the heart of the Pembrokeshire Coast National Park is Skomer Marine Nature Reserve, approximately 40 minutes steaming from Dale. Established in 1990, it is one of only 3 marine reserves in the UK and recognised for the diverse and prolific marine life it sustains on the northern tip of the Gulf Stream. The island itself is world renowned for its Manx Shearwater, Puffin, Storm Petrel, Guillemot and Razorbill colonies. Atlantic Grey Seals and Porpoise are common around the island with various dolphin visiting during summer months. Pains Rock, Garland Stone, North Wall, Rye Rocks, Middle Holm, Black Stones, Castle Bay, South Haven Pinnacles, Mew Stone, The Wick and Pig Stone. Crossing towards the mainland you have Tuskar Rock and Jack Sound then popular second dive locations at High and Low Point. Outside the reserve there are a large number of dive sites to be explored around Skokholm and Grassholm Islands, Hats, Barrel and Smalls offshore reefs, St Ann’s, Stackpole and Linney Heads, Stack Rocks and Hen and Chicks to name just a few. There’s a diverse marine ecology to each site and you may well see anything from an octopus to a seal. 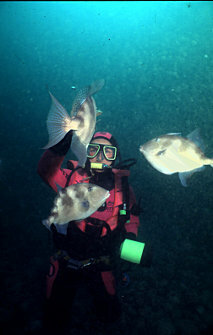 Specific species can be targeted by location, for instance, if you particularly wish to dive with seals or see trigger fish, then you stand a good chance at certain times of the year. Pembrokeshire is credited with around 500 wreck sites. The vast majority are largely broken up as a result of the winter gales on our exposed coastline. However, there are a few worth mentioning. The Dakotian (John Liddiard wreck tour 19), Behar (JL wreck tour 37), Loch Shiel (Whiskey Wreck) and an upturned landing craft are the more recognisable wrecks lying within the Milford Haven waterway. Heading South you have the Highland Home (JL wreck tour 106) off Freshwater West and Nicolaou Virginia (JL wreck tour 28) off Flimstone Head. Besides these, there are remnants of various wrecks around the islands and offshore reefs already mentioned. These include the Thomas Vaughan, Dalserf and Cambro.